Umar Saif is a Pakistani computer scientist and entrepreneur, who is known for his work on using ICT solutions for developing-world problems. He is also the founder of Plan9, Pakistan’s largest start up incubator and is often credited as one of the main forces behind the IT ecosystem in Pakistan. 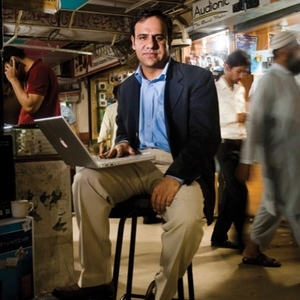 In his role as the Chairman of the Punjab Information Technology Board, his work to introduce technology in government using low-cost smart-phones has had a transformative impact in Pakistan. The World Bank President highlighted this work as one of three global examples of good governance innovations in his landmark speech on governance reforms in Philippines. Umair Saif, you are one of the world’s, I would say, leading entrepreneurial thinkers and innovators and I’ve been involved in that space for quite a bit of time. Personally as an entrepreneur here in the States and as a mentor to an organization called Start Co where we do a lot of incubator work as well for start ups from the states and a few from overseas, but what you’re doing is way past that. Your education is unbelievable. I’d love to hear stories about your time. I went to Harvard for a course on global public policy which was exhausting and expensive. I worked for MIT for 4 years and before that I did my grad school at University of Cambridge in England. Wow. That’s impressive. You’re really involved in Pakistan. So, you’re in Pakistan now, where are you at in Pakistan? I live in the heart which is a sort of historic, traditional city in Pakistan. It’s also one of the largest, it’s the capital of the province ofPunjab. Punjab is the largest province in Pakistan, about 60% of the people in Pakistan live in Punjab. If Punjab was a country, which is this province, it would be the 9th largest in the world by population. As you know, Pakistan is the 6th most populous country in the world. Yes. Wow. That’s amazing. So, Umar, you’re known for being a computer scientist and an entrepreneur and you need to explain this because I don’t understand those and maybe I won’t even after you explain it. I wouldn’t be surprised with that. But, you’re known for your work using ICT. Explain what that means. ICT stands for Information and Communication Technology. That’s basically internet and computers. Most of the time that I’ve – in the last few years I’ve spent trying to solve local problems in Pakistan and in general, the developing world using interesting IT solutions. As it happens, most of the products, IT products that got designed and a clearer example is that of an iPhone, are designed for markets that are fundamentally different from the physical reality, the economic reality, the social reality of countries like Pakistan and in general the developing world. For instance, the iPhone 5 is designed for a market where people are tech-savvy, more in applications and use it as a full blown entertainment device. Whereas the top three uses of a device like a cellphone in Pakistan is that to give what I called a missed call which is calling people to let them know that they must call you back. If you don’t have enough money to make a full phone call, it’s to use the cellphone as a torch because of all the electricity outages and etc and to use the cellphone as an FM radio because that’s the sole source of entertainment. The iPhone or the exciting new greatest and the latest Android phones are not really designed for that. You can torture that device to do all three things, you could turn on the flash such that it looks like a torch, you can use it as an FM radio by inserting headphones in it, etc, but that’s not the functionality that that device is designed to perform. Therefore, most of the work that I do is thinking of solutions to very local problems of the developing world. That’s surprising to me. So, the flashlight, the FM radio and then the call and hang up just to let somebody know to call you back on their own time or their own penny, their own cent, their own whatever currency you want to use. So, the flashlight makes sense, the FM radio, that’s interesting to me. So, most programming in these developing countries come still over the radio waves not via connection to a cellphone tower or internet, is that correct? Internet is very techie and one would expect even though the local internet would change disparity in it. And then obviously there’s television. There’s trust your television. For people who are on the go and on the cellphone, for them, the FM radio on the cellphone is a major entertainment pool to invest in this technology. They are particularly using it to make missed calls or just to ask people to call them back and to use it to listen to songs that they like on FM radio. That’s essentially how all the cellphones are used. Obviously, there is no cellphone in the world that is designed for those two purposes. There are some product designed for the developing world handset with those features, but no one in the world is thinking about designing products with just that. That is sort of an extreme example in this spectrum, but I think there are lots of interesting products solutions in our research that needs to be done in how technology is used in the developing world. I love it. Wow. That’s creative and extremely engaging and then there’s so many people who are just tapping that market now. For an entrepreneur like yourself and for so many other people who’d love to back projects financially, I think there’s a lot of investment opportunity there. If you get the right information behind the right product, is that right? Yes absolutely. I think there would be…Google is is waiting to happen from economies, countries like Pakistan. Between Indonesia and Pakistan and Philippines, etc, you have one of the largest markets for cellphones for instance. Pakistan is the 9th largest market for cellphones in the world. We have 135 million cellphone users in this country. We’re also one of the largest texting countries in the world. If the text said enough, then they use the phone call, so just text each other. I think they sent about 250 billion SMS just last year as of your published figures. There’s a lot of opportunity for monetizing the use of technology in this part of the world. So, a program like this, I Share Hope, we record it and then we release it on an MP3 file via podcast typically, but we have a direct MP3 file download link on our website. Is that something that the average cellphone user or average person in Pakistan could actually get a hold of? Or, is that type of file or media not really accessible? I think this is accessible, but the bandwidth etc is not such that we could use streaming video or any of that in real time. Okay. That makes sense. Well sir, let me ask you these questions about hope. So, here’s how we do this for anybody who hasn’t already heard the background. We’re interviewing a thousand leaders of hope around the world. What that means practically speaking, an easy way to think about that is every 8 million people on the planet would get one representative on the survey. That’s how the numbers break down. So, this is an amazing opportunity because we’re talking into Pakistan which has a very different view of the world than other places. Each person we talk to is so different and comes from such different background and yet there’s this common themes of hope that seem to connect humanity all over the globe, so Umar I really appreciate your time. My definition of hope is trying to persevere. So if someone is willing to persevere in the things of adversity, you’re basically driven by this force that we call hope. My favorite thing to say about hope is this little instance that I was called in college by a professor. He explained an experiment, I think, that on frogs. It was a laboratory experiment where they put frogs in water for seven hours and the frogs have to swim and swim to stay afloat and to stay alive. At the end of that experiment, some of these frogs have drowned and the rest were rescued and put into another jar and that same experiment was repeated again. The ones that got saved because they had hope that they could live, in the next experiment, swam for much longer. Actually, 10 times longer in the hope that they would survive again. The ones new to the experiment gave up much more quickly. So, I think this ability to persevere with the hope that you would come out on top and survive is what, for me, defines hope. Good example and a great definition. I’ve never heard of that experiment. That’s very consistent with so many of the other conversations we’ve had here on I Share Hope. If you do, when and you succeed and you get another chance, it really does build for the next chance and the next chance and there’s so much needed in the way of giving a chance an opportunity to yourself or to others around you just to instill that hope and allow people to keep going because people are so strong and tenacious and can do so much. Question 2: Who’s given the most hope to you? Who’s delivered that hope so you can grow in your strength? I think the one person who has given me a lot of hope is my father. I suspect that would also be consistent with last interviews.I look up to him, my dad. He’s given me a lot of hope. He’s worked much harder than anyone I know and started out from basically nothing and be somehow to what he is today. I am rich in hope that I could come up to his standards and the way he is. My favorite thing to say about him is that he silently taught me everything that I am and everything that I hope to be. Wow. That’s wonderful. So, you’re father is still living and they’re in Pakistan with you or nearby? Yes. One of the primary reasons, he and my mom, that I came back to Pakistan. Wow. That’s wonderful. It really is. Question number three and I don’t know if this will get in there with your dad’s story or just with your life. Question 3: What’s been a time in your life where you’ve really had to lean on your tenacious hope? That determination to continue moving forward, to keep going, how have you used hope in your own life to overcome adversity? Well, as far as I’m concerned, I suspect that’s probably likely with most people. Life is very cyclical. Cyclical is making you sound predictable, but cyclical in a very unpredictable way where just about every new challenge that you take up, it takes you to a point where you have to see very, very darkness before you could get out. To me, it’s consistently being that way, so I have lived many lives and continue to live many lives where I am a university professor, so I do research, I’m an entrepreneur, I’ve done a little start up and I now both run a university as a counselor? and head of the sector IT projects for the government in Pakistan. On these lives, each one of these were new challenges when I started this different life and maybe get these four lives that are running in parallel. Each one takes you to a really, really dark place where, you know, you start an idea, you spend many months trying to raise money, building a team, building a team and building a product and someone else comes up with something much better and months of effort just goes down the drain. Then, you try one more time, try it one more time and when it’s about to work out, your team, your co-founders leave you. When it’s about to work out, your investor pulls out. Likewise in the government, the things that you want to do and you come this close and the government changes or someone key that you’re working with goes away and etc. So, there are lots of times when you really think that you can’t keep it together anymore and can’t keep going. One time, I think that one thing developed and that I think is sort of interchangeable with hope is faith where you kind of develop – just like going through the really dark periods and down times, there’s this faith that eventually all these dots will connect and all the efforts that you’re making and all the dues that you’re paying, you’ll accomplish something, it will come true. If one door closes, another door will open up but somehow in hindsight these things will work out. I’m not very old, I’m in my mid 30’s. I’ve certainly convinced myself of this such belief of this faith that if I keep at it, eventually things will work out. So far, it almost already have. You’re right. You’re right in that many people seem to say the same type thing. If you keep going, just keep going. Getting past that dark day or whatever is it in your life, if it’s an illness, if it’s a period of depression, if it’s a business or governmental issue, incarceration, addiction, there’s so many stories, but so many people continue to say you have to move forward, keep moving forward because you’ll catch it sooner or later. You’ll catch on. You’ll get it. You’ll make the next step, you’ll make the right connection or whatever the genre is. Great, great advice. Question 4: How are you using hope today? How are you building that into your life or the lives of others around you? I think just the fact that you dwell in this faith that things eventually will work out if you do all the right things. That you have honesty of purpose, paying your dues, working hard and you’re making sure that you never do anything that might harm the people. You’re doing all the right things and the things will work out. Once you develop this thing, there’s also – you need to share that faith to the larger conviction which I do with all the young entrepreneurs that I work with. I run a very large start up incubator here where you get equal – to come in with ideas wanting to build interesting projects and companies. I think the number one task I have is to evangelize hope. It’s to send them this faith, this belief that if they keep at it and do all the right things, they will one day succeed in life. I think once an entrepreneur, a professional, a university student internalizes this message of hope, then most of your work is already done. It’s just a matter of time before they get their big victory. I rely on this and I think a large part of my day is spent in evangelizing hope, in spreading this faith that if you’re doing all the right things, you will get something. I think once someone internalizes it, that’s half of that. Good points. Leading into question number five then. Question 5: What are some simple steps? If I’m one of your students, how are you going to tell me to continue building that hope? Are there two or three simple steps that I should keep repeating and going back to to make sure that I don’t get lost in the weeds, but actually stay on the track and keep pursuing my goal or my need to change whatever in life? I don’t know how to answer that. But, this is me, my own credible story that I tell people who work with me who see what I do to please keep the faith. Also, to inspire them with examples of other successful people, people who have come through really dark times in life and have subsequently gone on to do very well. Especially people doing IT start ups, the success rate is 52% even the start up things that really needs to get home. I think also statistically, if people are doing the right thing, they do keep getting this positive reinforcement at least often. So, I think in some days you have this faith and leave it to higher forces to guide you and to keep you on a straight and narrow path by rewarding you ever so often and showing you the light so you don’t get lost in the woods. Great point. I love the message of keep moving forward and it really does. You keep finding those opportunities where you get that positive reinforcement and you do continue seeing a new way and really, there is so many, so many times where in my life, it sounds like in your life and in other people we’re talking to, you might have never seen the way to achieve or accomplish or succeed at something if you hadn’t gone through the really dark period and that continuing to come back and trying again even if it’s 10 times later or a hundred times later, when you finally see that moment, that’s when the breakthrough happens. Not only on entrepreneurship, but in whatever situation you’re coming through in life. That’s really great advice. Thank you. Well sir, you’ve been tremendous. Is there anything else that you say, you know, we really should understand this about hope or this about how you succeeded in life? Is there anything else you’ want to leave us with? A last nugget of truth? I think one, I want to launch this effort, this effort of spreading hope. Those things seems hard in the sense that no one’s doing it. It seems like such an obvious and a simple thing to do, but I am glad that someone is and in a country like Pakistan with this security situation, there’s a lot of – there’s a very young population. 60% of the population in Pakistan is below the age of 30 and today for lots of young people really struggling to figure out what they are and what this country is about and about religion and extremism and where do we stand with the rest of the world and just the economic challenges and challenges of the developing world. There’s a lot of people in this country are going through. This message of hope should resonate well with such people. They need a lot of hope and large amount of this hope especially in a country like Pakistan. I’m glad you’re there. I’m glad you’re on the side of hope. I really am. Thank you Chris. It was such a pleasure to talk to you. Thank you. Sir, it’s been a privilege to talk to you. Thank you for your time. I will reach out to you and if people want to hear more about you or follow you on social media or websites, how do they stay in touch with you and follow your progress? With my Twitter account. My Twitter handle is @umarsaif to people wanting to follow me on Twitter. So, the Twitter handle is @umarsaif? Excellent sir. We’ll put that on the show notes and we’ll look forward to sharing the story of hope. What music do you listen to when you want to feel more hopeful or upbeat? What do you put in your headphones or in your car? What are you listening to? So, I listen to music, but there is this one song, English song that I like which is I Hope You Dance. When you get a chance to set it out, I hope you dance. That’s the song. I love it. That’s great. If you’re there listening to non-English music, what are you going to listen to? I listen to classical Pakistani indie music. You wouldn’t understand it.